We just realized a few nights ago that we just passed our second anniversary of leaving the dock in Seattle! What a two years it has been. We have met tons of interesting people, sailed a few miles, ate some great food, visited some magical place and look forward to more of all of those. And to think when we left that we originally had planned on being back in Seattle in two years, and now I have a work Visa in New Zealand, and plan to renew the cruising kitty down there and continue on our voyage. Also, having been on many different boats since we have left out here, I still don’t think I would change my decision on what boat to pick. Sure, you always have 2 foot-itis, or maybe 7 ft, but in the same circumstances I can’t think of a better boat in the price range for being solid, fast, sea-kindly etc. Thanks to Henri for making a great boat! We are currently awaiting clearance to leave the boat and hopefully eat dinner with Dilligaf tonight, but we are here safe and sound. Sadly, Britannia did not clear custom today and they are boat bound so we will have to wait another night for them to join us. 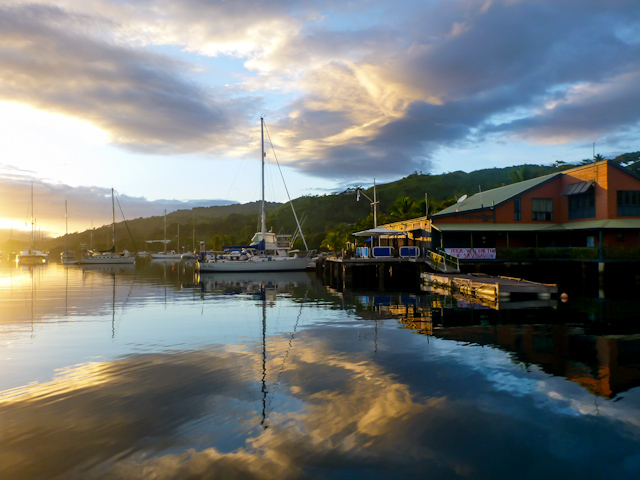 Savusavu is a lovely place. We had a great last night on Piko. The air is warm, the wind is from behind us, the swell is down. Taking a nap in the cockpit under a sky full of stars is something I have really missed since last season. The wind has continued to be light, and basically from dead behind us so we are having to gybe our way up into Fiji. Also, thanks to John and David with the Fiji Rally and Mike at Cater Marine in Opua. They have all be extremely helpful getting the part we suspect is causing the problem shipped to us in Fiji. I think that should be shipped out on monday hopefully and if all goes well, we will have ice again by the end of the week! Time to gybe and put the kite up, we really should have last night as well, but sometime you sacrifice a little boat speed to sleep without worries in the cockpit. Yea, you heard me, I may have some regret, but we decided NOT to go fast last night. Leaving Minerva for Fiji in the morning! Weather is looking good, should be in Fiji sometime on monday! It has been a wet and bouncy day so far, and sadly we lost our borrowed surf board overboard sometime really early this morning. The winds have been in the high teens to low all day and we are beating into it to get to NZ. The swell has also increased over the last few hours and Piko is a little more damp than usual. She is usually a pretty dry boat, but the dorades to drip a bit when we take a wave over the boat and we have a few small drip leaks here and there that have both of us annoyed at this point. I am downloading the latest forecast right now, but if the one from yesterday proves true, the wind should back off a bit over the next 6 hours or so which hopefully will decrease the swell and increase our speed. That would be great, since it will get us in around lunch time rather than dinner time at our current speed. Hopefully our next message will be sent when we are in site of land tomorrow!